Buy Biona Organic Pear & Apple Spread - 450g in the UK from our online shop or directly from our independent Scottish store. If you want to automatically receive an email when 'Pear & Apple Spread - Organic' is back in stock, just leave your email address below. Biona organic apple and pear spread is prepared from sun-ripened fruits without the use of chemical fertilisers or pesticides. 3kg of orchid fresh fruits are concentrated into each jar. Delicious used as a bread spread, on pancakes or in desserts. As official Biona stockist, we sell genuine Jams & Fruit Spreads directly from our shop in Scotland and online throughout the UK. Where can you buy real Pear & Apple Spread - Organic safely online? 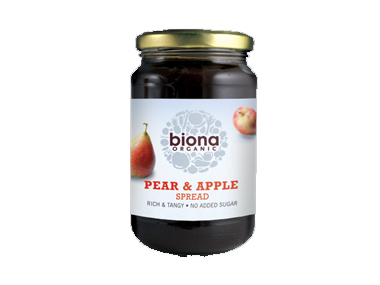 If you are wondering where you can buy Biona Organic Pear & Apple Spread - 450g safely online in the UK, then shop with us. We are an actual health foods shop; with real people selling real foods and products. Our award-winning independent shop is located in Stirling, Scotland since 1976. You can buy our Organic foods suitable for vegetarians and other genuine Jams & Fruit Spreads in store or safely place an order with us online or over the phone. Pear & Apple Spread - Organic - Biona Organic Pear & Apple Spread - 450g in Jams & Fruit Spreads and Honeys, Jams & Spreads.